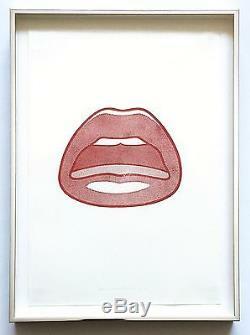 Tom Wesselmann Mouth, 1967 framed signed & dated limited edition. Tom Wesselmann Mouth, 1967 color rubber stamp print on Rives BFK paper 9 1/2 x 7 inches each 11 x 7 1/2 inches framed Edition of 225 Signed and dated "Wesselmann'67" in pencil lower center Unnumbered as published In pristine condition, recently floated in a steel frame with UV plexiglass. 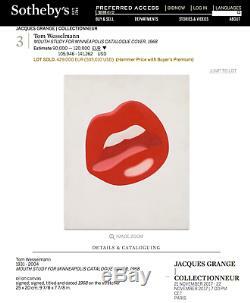 Printed and published by William Katz, New York This Tom Wesselmann print from Stamped Indelibly is in pristine condition and has been carefully stored since it was originally published, nearly 50 years ago. This is a GUARANTEED authentic Tom Wesselmann print in pristine condition. Dealer of Secondary Market Post War & Contemporary Blue-Chip Art Joseph K. Is an international post war & contemporary blue-chip art dealer and art advisory specializing in Andy Warhol and Jasper Johns. Has 3 Decades Multifaceted Fine Art Experience Joseph K. Levene, a Jasper Johns and Andy Warhol print authority, has 3 decades of multifaceted fine art experience, including perspective as art dealer, online gallery, fine art executive and collector. Levene, a Wharton Business School graduate, was previously President/COO, Petersburg Press, Inc.
Joseph K Levene Fine Art, Ltd. Authenticity Guaranteed Since 1999 Joseph K.
Browse blue-chip prints & multiples. Christo, Jim Dine, Damien Hirst, Jeff Koons, Robert Indiana, Ellsworth Kelly, Roy Lichtenstein, Richard Pettibone, Thomas Ruff, Hiroshi Sugimoto. The item "Tom Wesselmann framed Mouth 1967 hand signed dated pop limited edition JKLFA. Com" is in sale since Thursday, March 9, 2017. This item is in the category "Art\Art Prints". 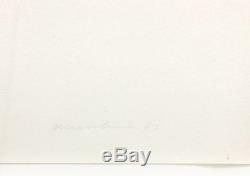 Signed: Hand Signed "Tom Wesselmann"